Kevin Allen Psychic Review – review of psychic readings by Kevin Allen, a world-renowned psychic and owner of Mystic Curio in Royal Oak Michigan. Mystic Curio operated as a New Age store in Harrison Township MI selling tarot cards, tokens, trinkets, potions, books and art. Kevin Allen (and others) held readings in the back of the store by appointment-only. 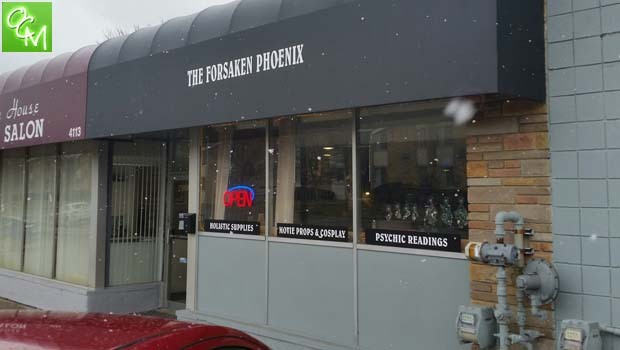 After the death of one of the owners, Kevin closed the retail aspect of the store in Harrison Township and moved the location to Royal Oak, MI in 2014 where he hosts clientele for one-on-one-psychic readings by appointment at two locations – The Actor’s Loft & The Foresaken Phoenix (a small store dealing steampunk items and movie props). I’ve gone to Kevin Allen for psychic readings numerous times since 2009 and have been amazed by the experiences. My journey with Mystic Curio (and Kevin) began years ago when I was watching a Dateline NBC episode regarding a cold case of a local Michigan girl (Cindy Zarzycki) who went missing in the 1980s. As a kid growing up on the east side of Metro Detroit, I remembered the case from my youth. As the case was re-opened over 20 years later, homicide detectives enlisted Kevin’s help (based on his reputation) and Kevin was able to offer tips to help solve the murder and contribute to the cause of finding Zarzycki’s body. I paused the Dateline episode on my DVR when they showed the storefront of Mystic Curio and begin Googling Kevin Allen info as I had never been to a psychic before and was immediately curious. Getting an appointment for a reading with Kevin Allen at Mystic Curio is not an easy task. Basically, you have to call Mystic Curio on the first Tuesday of every month to book an appointment for the following month. It can be a bit like a radio station contest. You have to speed dial and hit redial often to finally get through and hope for the best when it comes to Kevin having any appointments available. Mystic Curio’s website (see below) also has links to set up appointments online or via email but the format is similar – first Tuesday of the month books the following months and appointments go FAST. If you don’t live in Michigan, Kevin now offers phone readings. Having no previous dealings with psychics (or the paranormal or new age stuff in general), I had no idea what to expect from my first appointment with Kevin. 1. Bring cash! Current prices for readings at Mystic Curio are $60. Cash only. Tips are accepted (sometimes reluctantly) but not expected (I usually bring him a plate of cookies lol). 2. Bring a recorder or smart phone to record your reading. Kevin works EXTREMELY FAST and there is SO MUCH to take in that you’ll find your recording of your reading extremely helpful. 3. Bring a small list of questions. Questions don’t even necessarily even have to relate to you but could relate to a friend or loved one. 4. Don’t be nervous! Kevin is incredibly friendly and engaging. Kevin is super-friendly, amiable and laid-back. He’ll greet you in the waiting area and take you to small office. Kevin uses Tarot cards for his readings but uses them in a slightly unconventional manner (no Tarot card spreads or complex analysis of cards). He’ll ask your full name and date of birth as you shuffle the deck of well-worn Tarot cards. Cut the deck and Kevin is on his way. Kevin will flip through your cards and quickly, almost immediately, begin systematically telling you about your life, your family, your joys, your worries… it’s truly an amazing experience! Be careful not to pause and interrupt. I can’t stress this enough. You’ll be tempted to ask 10 questions for each statement he makes (that’s why you’ll need the recorder). The best approach is to let Kevin be Kevin as there will be time at the end of the reading for specifics and questions. It truly is a rapid-fire reading. It’s very common for him to jump from one subject to the next with amazing accuracy. Be patient. Without being drawn-out or too specific, I’ll sum up a Kevin Allen psychic reading like this… If I have 5 things on my mind going into a reading (career, health, family, friends, money), Kevin knocks through those issue virtually in order with incredible insight. It’s the fastest half-hour ever. After about 15 minutes, Kevin will start to slow down and eventually say “OK, anything else?”. This is your cue to ask specifics of any of the several things he surprised you with and he’ll address those. Again, be prepared! My first reading (I’ve had 7 since) I was so surprised I wasn’t expecting it to go so fast or a Q&A session. Everyone has their own beliefs in regards to psychics. I’m not here to debate anyone or scream “it’s real” or “it’s fake”. For me, my “proof” is in my tapes. I do feel that Kevin was able to give me valuable insight into my world and that insight has allowed me to grow and expand my horizons. For more info on Kevin Allen Psychic, visit themysticcurio.wordpress.com.